Manufacturer of a wide range of products which include wall mounting enclosure cabinet box. Standard width 300 mm ~800 mm in pitch of 100 mm. 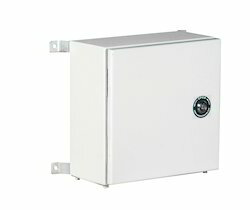 Standard height 300 mm ~ 1200 mm in pitch of 100m m.
Wall Mounting Enclosure Cabinet Box offered by us find usage as wall hydrant cabinets for providing hose-connection to water supply and is used by fire brigades. These can also be supplied with a separate compartment for extinguishers as well as can be made available with mounting fixture for fire alarm push-button. These Wall Mounting Enclosure Cabinet Box also provide ideal storing options for small containers near work areas without consuming extra floor space. Further, the eye level positioning also allows easy handling of the equipment if required. Welded body with sides, top and bottom closed in 1.5/2.00 thk folded CRCA sheet. Front single door / split doors / partial doors in 2.00 thk CRCA sheet. With support frame, sheet metal special hinges, cam locks. Gland plate at the bottom in 2.00 thk CRCA. Component mounting plate in 2.00/3.00 as per requirement. Size (Width - 60) x (Height - 60) mounted on welded bushes at rearmost position. These types of enclosures are not suitable to join together, however if needed we can join them. As side walls are not removable, inter panel separator is not required here. Wall mounting brackets 4 nos per enclosure are supplied in 3.00 thick. DIN standard 19” equipments mounting arrangement is possible. Swing frames suitable for 19” mounting in width and height as per requirement. We are the prominent organization of this domain engaged in offering a wide spectrum of Wall Mounting Enclosure Cabinet Box. The offered cabinet is fabricated in assistance to our adroit professionals who use pristine quality materials, avant-garde designing techniques and follows the industrial standards throughout the production. In addition with it, the provided cabinet can be bought at a reasonable price from us. 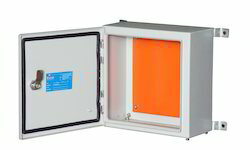 Since our inception, our firm is affianced to introduce a premium quality array of Wall Mounting Enclosure Cabinet Box. 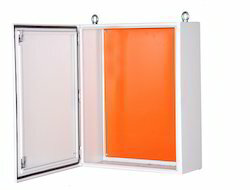 This cabinet offers an exhaust air, comfort closing and opening, and high-quality metal fabrication. In addition, the offered cabinet delivers 10° slope font that allows an ergonomic design, fatigue-free working posture. Furthermore, this cabinet is mounted on the walls that help in making the room area spacious. The offered cabinet is manufactured using quality metal alloys and advanced technologies. As an affluent name of this domain, we hold expertise in presenting high quality of Wall Mounting Enclosure Cabinet Box. This cabinet is manufactured by making use of quality approved raw materials and advanced manufacturing techniques by our experts. Moreover, the offered cabinet is checked on several testing procedures under the direction of our quality analysts prior to dispatch. 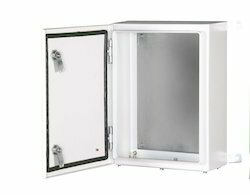 Provided cabinet is suitable for chemicals or solvent heating and stirring applications in laboratories. As a trust worthy organization of this domain, we are committed to offering our clients a superior quality assortment of Wall Mounting Enclosure Cabinet Box. This cabinet is used for assembling in testing equipment, tools, and other materials and items related to domestic and commercial areas. The offered cabinet is demanded in various industrial areas. Following defined norms of the international industry, our team of experts manufacture the offered cabinet by utilizing premium grade raw materials with the aid of latest manufacturing techniques. 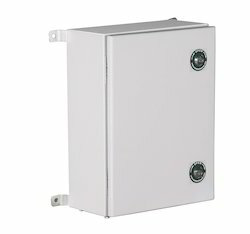 Looking for Wall Mounting Enclosure Cabinet Box ?